As with any CRM system, duplicate contacts or accounts will inevitably find their way into your Zoho CRM database. Let’s take a look at the tools Zoho CRM provides to help users deal with these duplicate records, as well as ways to avoid them in the first place. We can start with a proactive approach, by not allowing duplicate field values across records within a particular module. 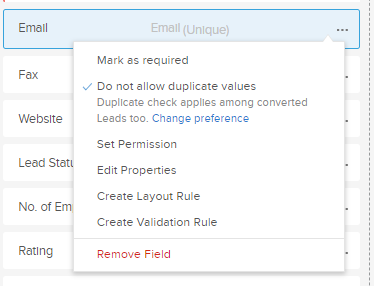 For example, the Email field under the Leads module can be set to “Do not allow duplicate values”. This prevents users from entering a new Lead having the same email address as an already existing Lead. Although this rule is typically only enforced within a single module in Zoho CRM, the Leads module is actually a special case. 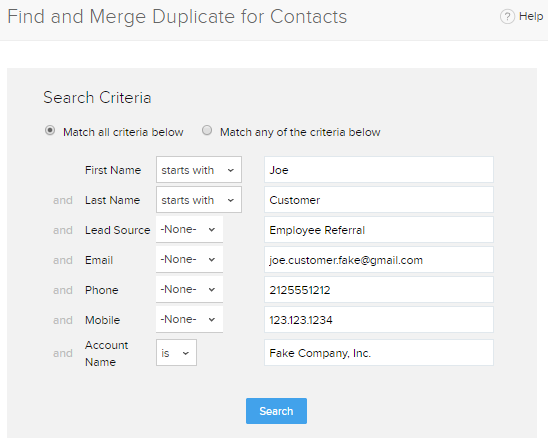 The Leads module uniquely has the additional option to also cross-check Converted Leads, Leads that have already been converted into Contacts, in the Contacts module. Let’s say a user happens to come across a duplicate Lead, Account, or Contact while doing a search or other action inside of Zoho CRM. So now the user already knows there is a duplicate set of records which the user wants to merge. First, the user should open one of the records (Lead, Account, or Contact) in the Detail View. 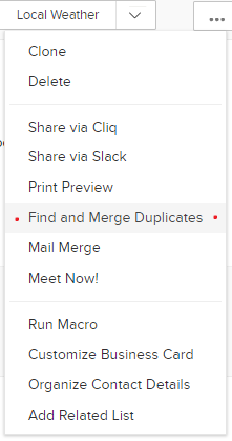 From there, the user can easily access a “Find and Merge Duplicates” feature from the ellipsis menu button. Zoho CRM will present the user with various pre-populated search criteria to choose from when looking for potential duplicate records. After the search is executed, Zoho CRM will display potential duplicate records based on the given criteria. After being presented with the search results, the user may select up to 3 records to be merged into a single surviving “Master” record. If ALL data field values match exactly across ALL records selected for merge, Zoho CRM will instantly combine those records into a single Master record. All Notes, Attachments, Activities, and other Related List data will be combined into theMaster record. However, if there are any mis-matched data fields across the identified duplicate records, Zoho CRM will present the user with a detailed record matrix, allowing the user to choose the surviving record data, either by one of the duplicate records as a whole, or more granularly on a field by field basis. The system even makes some assumptions to assist the user. For example, it gives more overall weight to the record having more fields populated, yet automatically gives preference to any record’s field that has data over its blank counterpart. within a List View of the Leads, Accounts, and Contacts modules. There is a menu option there for “Deduplicate Leads/Accounts/Contacts”, its title depending on what module is currently active. After selecting the Deduplicate menu option, the user is presented with a choice to select one or more fields to be used to identify potential duplicates within that Module. For example, when attempting to use Deduplicate Contacts the user is presented with fields: Email, Phone, Account Name, and Mobile. A maximum of 3 fields can be selected simultaneously. The field selection list is pre-defined by Zoho and cannot be customized. 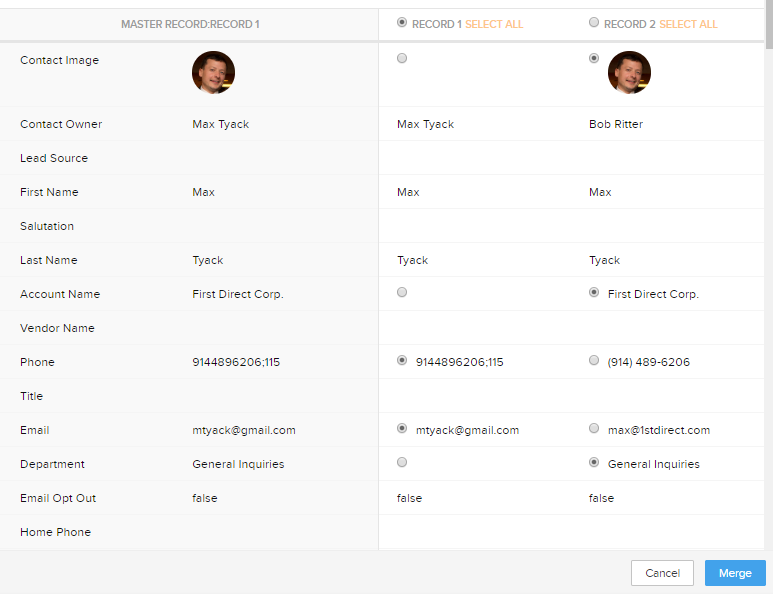 Zoho CRM will go through all of the records in the module and identify duplicates. This process can take a while, so users may move on to other things while Zoho CRM works in the background. When the process is complete, Zoho will display a popup to the user and end the user an email notification. The process does one of two things based on the type of duplicates found. First, it will automatically merge all records where ALL fields match exactly. Then it will present the user with a list of detected duplicates which have some mismatch fields. The user can then review the list and resolve conflicts for each set one at a time, similar to the record matrix described in the previous section of this article. Important – Be cautious when performing duplicate merging actions! It is a good idea to request a database backup prior to doing any extensive deduplication, just to be safe. If you’d like to learn more about these Zoho CRM features, or have any questions about Zoho CRM, or Zoho applications in general, please contact us here at First Direct Corp. We are your Zoho experts! Contact First Direct for your Zoho needs!